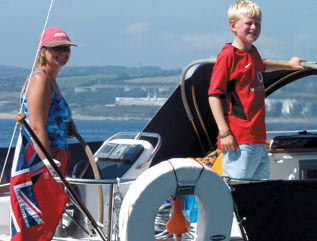 Why not combine a fabulous 7 day relaxing family sailing holiday exploring the beautifully rugged South Cornish Coastline, with RYA instruction to the level of RYA Day Skipper Practical? The 7 days run from Saturday – Saturday 4:00pm – 10:00am. You will stay on board one of our 6/8 berth sail yachts and either coastal hop along to Plymouth, Dartmouth and Salcombe or go west to Newlyn, Penzance or even the Isles of Scilly. Our fully qualified RYA Instructor will stay on board with you for the first 5 days, to give you all tuition for either RYA Competent Crew or RYA Day Skipper Practical. You will then have 2 days, once at least 1 RYA Day Skipper has been completed, on your own to explore the local area with your new found skills. Although the itinerary for the week will be based on the RYA syllabus, it will be designed around the needs of your family. Therefore it can include day sailing to the beautiful un-spoilt Helford River and Fowey as well as going further afield to Salcombe or the Isles of Scilly. The cost of £2495.00 per week; includes RYA tuition, certification, all mooring and berthing fees, fuel, all meals eaten aboard and the use of qualify Musto wet weather gear. We would need an assumption that at least one member of your crew is at the level of RYA Day Skipper Theory prior to the holiday taking place. The RYA qualified Instructor will live aboard for the first 5 days to complete at least 1 RYA Day Skipper Practical course.